It's advised that children of this age avoid staying inactive for two hours or longer and get at least one hour of moderate or strenuous physical activity most days, as well as several 15-minute intervals of physical activity of any kind per day. So take away the Gameboys and Nintendos, switch off the telly and get those couch potatoes outside in the summer sun! Children of this age should be offered as many opportunities to get involved in sports, games and various other physical activities as possible. Talk with your child to find out what he or she wants to do, and what kinds of sport they like and dislike – their answers may surprise you! Most children will love incorporating physical fitness into their day, as long as it's something they like. 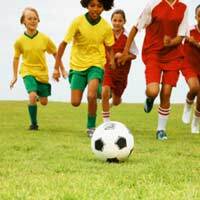 Studies have shown that children who are regularly involved in team sports are much less likely to become obese adults, are more flexible and less likely to suffer from illnesses such as diabetes, and choose healthier lifestyles when they're grown up. Team sports aren't for everyone, but children who enjoy taking part learn a lot more than simply the rules of the game. Whether your child chooses to play football, basketball, field hockey or cricket, the psychological benefits can be as important as the physical ones. Being able to distinguish between healthy and unhealthy competition, and being motivated to always try your best. If your child wants to be part of a team, the two of you must work together to find a sport they like. Once they do, find a group that actively encourages everyone to play, not just the most capable, and where the emphasis is on fun. It's important that the coaches concentrate on the ethics of a sport, not just the rules of the game, and that the children are constantly challenged and learning new skills. As a parent, you will need to attend as many games as possible, but be as interested in the intricacies of the game as much – or more so - as who won. You'll need to incorporate regular practice into your daily lifestyle, and praise your child for even the most simple of tasks accomplished and skills mastered, not just for winning. Taking part in sport on a regular basis is important for growing children. Not only does it help them stay physically active, but it also helps them develop strength and coordination skills, and teaches them both how to be a leader and a team player. Children don't have to be competitive to participate in sport, and it's important that parents realise that team sports aren't for everyone. By the time your child turns eight, he or she will probably have already developed a set of likes and dislikes, and will know what type of sport is preferable for them. Take the time to discuss with your child what kind of activity they would like to pursue, and let them try a variety of different things until they find the right fit. As long as your child learns to enjoy being physically active and makes fitness an important part of their daily lifestyle, the battle is won.